Two patterns that never fail to grab my attention are polka dots and stripes. I tend to collect striped shirts and swoon when I see polka dots (I have more restraint with this pattern, as I try harder to avoid looking like a 5 year old). As of late I have been admiring the pairing of the two together or the overload of an entirely polka dotted, or striped ensemble. Who knew there was so much to do with such simple patterns? 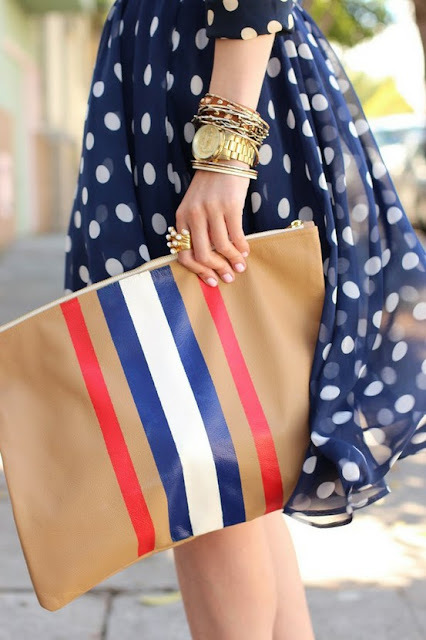 Of course, the nautical look is a classic, but stripes in bright hughes and varying patterns (that are not necessarily "nautical") are adorable too. I believe the reason I love these two patterns so much is because I like order and symmetry.